I have been looking forward to seeing this movie ever since I heard about it over a year ago. 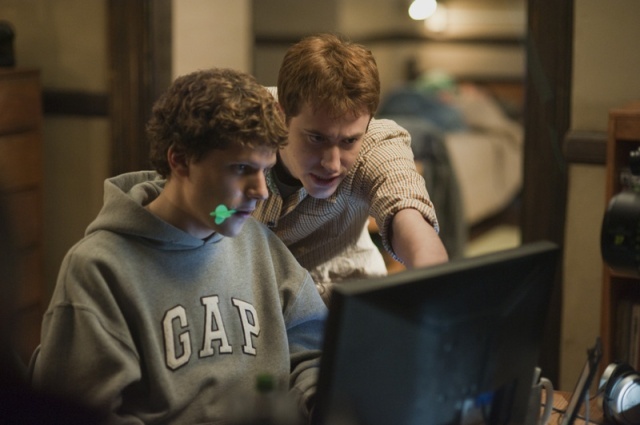 The Social Network showcases the magic that results when two major Hollywood talents - director David Fincher and screenwriter Aaron Sorkin - are matched with great material. I honestly do not have anything bad to say about this film. I was seriously blown away by how well this fictionalized yet semi-fact-based story about Facebook came together. It's seriously one beautifully multilayered piece of intelligent entertainment. It's definitely going on my list of 10 best movies of 2010. And there's already Oscar buzz for a Best Picture contender. We begin our story in 2003 at Harvard University. It's there that we are introduced to the socially awkward Mark Zuckerberg, played by the talented Jesse Eisenberg - who I simply love and adore. After his girlfriend (Rooney Mara) dumps him, he takes his semi dunk and pissed off self back to his dorm where he decides to get revenge by creating a hot-or-not website that ranks the university's female students. 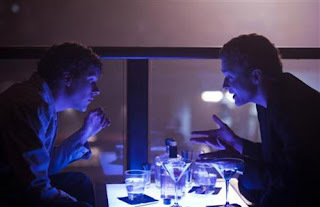 After creating university street credit, he is approached by the Winklevosse twins who are aware of Zuckergerg's reputation for computer wizardry. They propose teaming up with him to create a Harvard-centric dating site, Harvard Connection. They want to pay him to build the site and offer him a share of the profits. However, Zuckerberg has different plans. The reason this movie is outstanding is simply because everyone involved is absolutely brilliant. The directing and editing is superb and spot on. I loved the whole style and feel of this film. I wouldn't expect anything less from Fincher. His creativity has always impressed me. Then there's Sorkin, (who actually makes a cameo in the film as an Ad Exec. ), whose writing always stands out in pronominal light. It truly sings in this film. The dialog was so great - moving like a speedboat of non-stop banter. Not sure if anyone else caught this, but the way Zuckerberg interacts with people, i.e. how he phrased his questions etc. - "Do you confirm or deny this?" is very inte resting. It's exactly how Facebook runs - quick and to the point. Once again Trent Reznor was brought on board to score this film and like always he does great work. The music fits perfectly with each and every scene. I loved it! The character development is deeply enriched and moving. I was impressed with Justin Timberlake’s portrayal of Sean Parker. 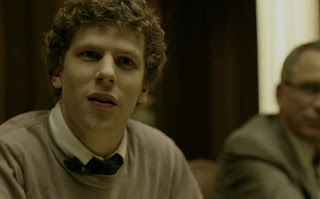 I found it ironic though, that a musician was cast to play the guy who founded Napster. Timberlake definitely holds his own and does a great job. Andrew Garfield, who plays Eduardo Saverin, the CFO, lends a strong moral counterweight as the sensible and likable supposed victim. Everyone does a great job, but this is really Eisenberg’s film. He was perfectly cast. I don't think anyone could have done a better job. His energy, vitality and sense of missio n is what brings this movie to life. I wouldn't be surprised if he was nominated for best actor. He’s phenomenal! Below is a great clip from the movie. You should definitely watch it! It's actually my favorite scene in the whole film. This movie isn't so much about the origin of Facebook as it is about the trials one faces in their relationships with others. It's about ambition, betrayal, trust, greed, power and friendship. The Social Network is riveting; it zips along, told mostly in flashbacks and over all does a great job delivering. I highly recommend seeing it. Also, this is the first movie that I have ever rated this high. I loved every minute of it. 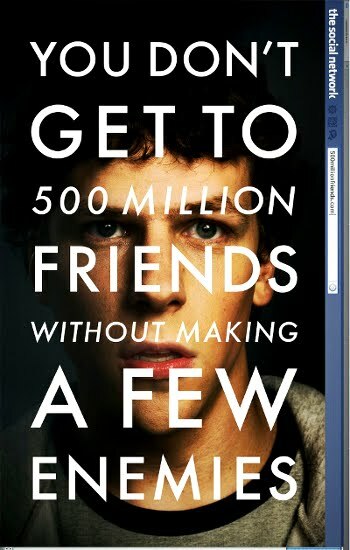 Since none of the real people participated in the making of this film, the question is, how true is The Social Network? Click on link to learn more: Is The Social Network True? I heard the reviews were outstanding. Must see it, too. Excellent review. I think it's your best one yet. Can't wait to see the movie! This movie made me immediately obsessed. I can't stop talking and thinking about it. Mostly, I'm dying to figure out how much is true! The Best Of Jesse Eisenberg!